The impacts of climate change on grazing lands and the livestock operations that depend on them will vary by region, type of grazing land, vegetation community, and the type of livestock. 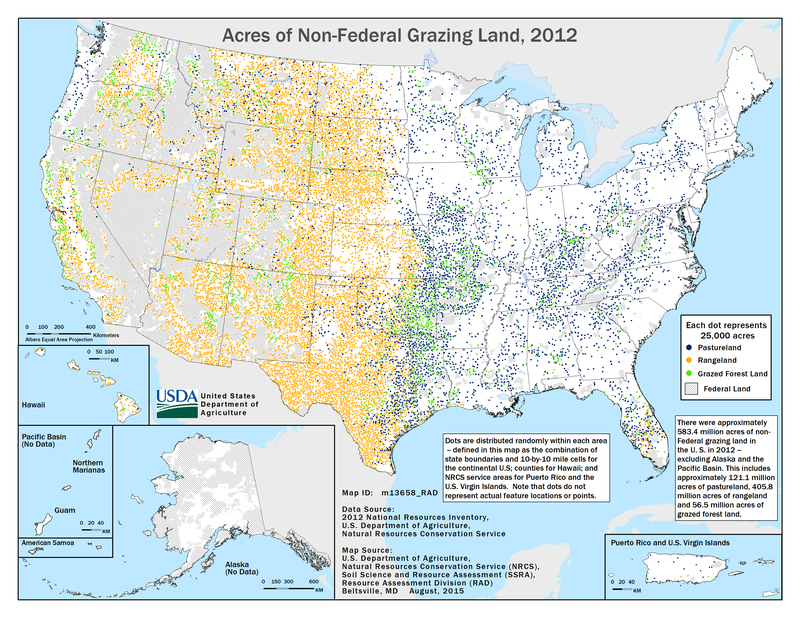 These impacts are superimposed upon other factors such as land ownership, historical and current management, demographic changes and access to USDA programs. Rangelands cover an area of 405.8 million acres or 21% of the U.S. surface area. In the Western states, rangelands are predominantly Federally-owned lands, whereas over the Great Plains, rangelands are privately-owned. Pasturelands are also privately owned and cover 121.1 million acres (6% of the U.S. surface area); pasturelands are more common in the wetter half of the US, to the east of the 97th meridian. Rangelands and pasturelands are both used for grazing but the difference between the two is that rangelands support natural (and usually native) ecosystems while pasturelands are highly managed, cultivated systems.